Wedding venues are all about decadence, luxury, and sheer sophistication. They’re about creating memories and sharing special moments with loved ones that can be cherished years from today. Selecting the right wedding venue for your big day is a decision of a lifetime and that’s why we bring to you the finest event spaces in Tampa. Today’s pick is for your Armature Works Wedding. Which means means that you’ve chosen to make your wedding a sparkling occasion, all set against Tampa’s captivating and coveted backdrops. 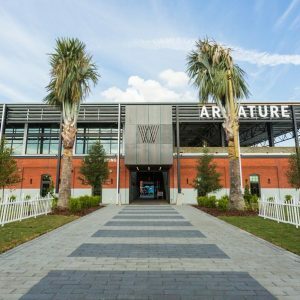 Located at the heart of Armature Works, invite guests to a soothing open-air location. The space manages to tickle the senses with an outdoor feel while being situated indoors. What a treat indeed when the evening breeze fills the night with its subtle calmness. The Courtyard can host a heartwarming cocktail reception, sensation bridal party or a memorable intimate wedding ceremony too. With a capacity to house 100 to 150 guests, private gatherings can now be termed memorable for all the right reasons. What could possibly set the tone for a perfect evening better than the right ambiance? The Social Room does true justice to its name by giving guests plenty to talk about after a memorable night’s gathering. The Social Room can seat up to 100 guests, making it a cozy affair against all others. Located at the West entrance, the venue space can serve brilliantly for wedding functions, pre-wedding bliss or simply a standalone event too. The room’s inviting aura comes with its stunning shades of grey facades, and impeccable lighting system. So why not indulge family and friends to a special event that will leave them socially engaged timelessly. 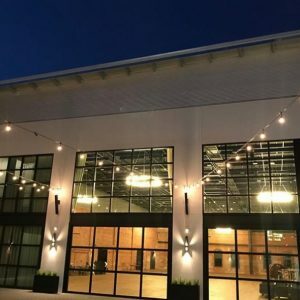 Part of Armature Works most popular venue spaces, the 10,000 sq ft gathering can seat up to 700 guests. It can restore historic charm like never before. 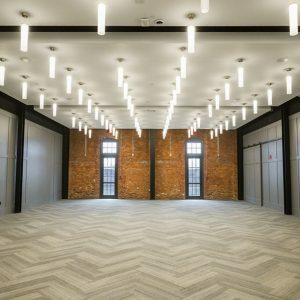 Combing a rustic flair with contemporary modern design, and seamless lighting systems, you’ll keep guests entertained in the entire venue’s grandeur. And it doesn’t stop there. You can take advantage of the two adjoining spacious areas that can be planned eventfully to host pre-function deities to absolute gratification. Allow guests to gather indoors for a heartwarming meet and greet session in the social room. All while giving them the option to sip on delectable cocktails in the courtyard. The versatility of the Gathering gives you the opportunity to instill formal dining experiences as well as informal cocktail evenings. Ever felt the need to do something a little exciting and innovative at the same time? Weddings are about celebrating your journey. What better way of doing so than by giving guests an open-air celebration that’s complete with the most coveted views in Tampa. With a capacity to host up to 500 guests, The West Lawn is a timeless choice for weddings as well as receptions. Where you can celebrate your outdoor union behind the stellar views of the Downtown Tampa sunset. And what’s even more exciting is giving guests a chance to cross over via water taxi or boat. Posing under the city’s iconic skyline is truly a winner in our books. The glorious Social Halls has an old-school historical flair with its wooden floors and brick-laden walls. With plenty of natural and artificial lighting coming in, talk about nailing the poses and achieving every wedding photographer’s dream. With a capacity to hold up to 200 guests, the Social Hall can accommodate private event. Small-scale private dinners, intimate wedding receptions, bridal shower as well as fantastic cocktail evenings for weddings. 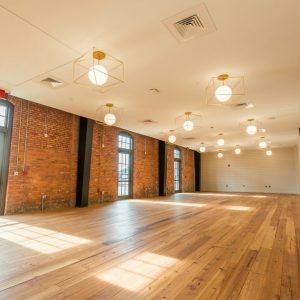 While the spotlight would be on you, guests can share in on your experience by being engaged in the venue’s historical tone at this gorgeous six-acre space. 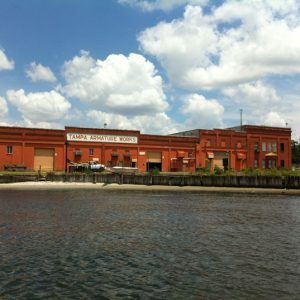 Being transformed from a hip performance locality into a mesmerizing event space that overlooks the Hillsborough River. The Theatre is redefined elegance in its entirety. 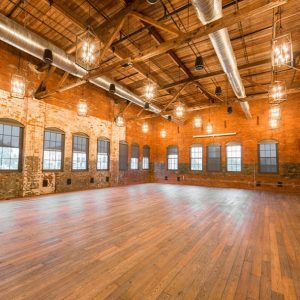 While staying true to its roots with rich wood loft ceilings and original floors, stun your guests for an event of a lifetime. 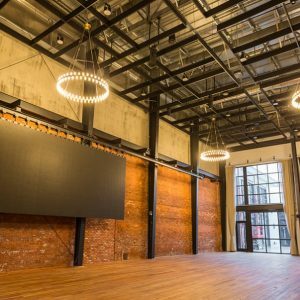 How would you use the event spaces at Armature works to give your guests an experience of a lifetime? If you are interested in hiring a wedding planner that can help in choosing the right venue. 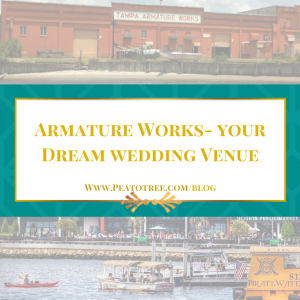 Let Pea to Tree help you as we’ve worked there and continue to help our couple plan their Armature Works wedding. Contact us today!